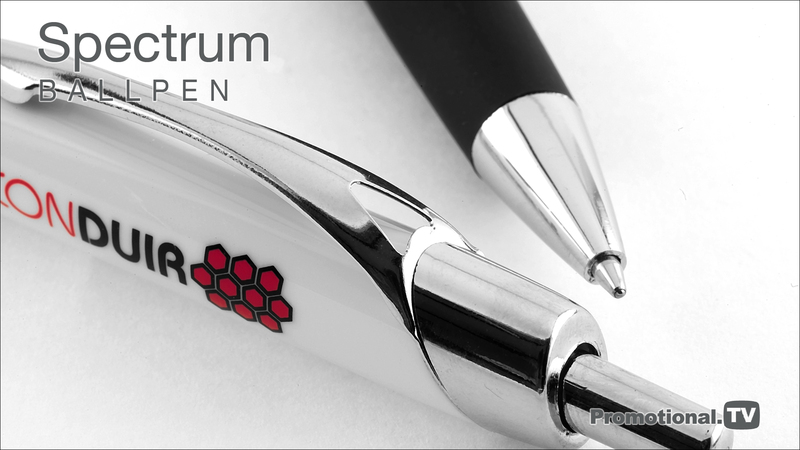 With its polished chrome trim, colourful rubberised grip and large print areas The Spectrum Ball Pen is ideal for promotions requiring faithful reproduction of your corporate message or logo in full photographic colour. Its branding potential is therefore not limited to any particular market. Our unique construction enables it to be fully compliant with current safety regulations; it comes with a black refill containing documental quality ink and is available on our 24 hour express service at no extra cost to you. The Spectrum Ball Pen operates on a push-button mechanism and your corporate message can be printed on either or both sides of the barrel in full photographic colour. Accurate spot colour printing is also available on this pen should you wish to faithfully reproduce your corporate identity. It can be provided with a range of optional presentation packaging, including high visibility pen pots for you to use at your next corporate event.